New York (TADIAS) — When Bethlehem Abera Gronneberg, a mother of three boys and a Software Engineering Manager who works and lives in North Dakota, returned to Ethiopia on a family vacation in 2008 an idea for a children’s book based on her birth country was already percolating in her head. Eight years later some of the photos that were taken during the trip, mostly by her husband and sister-in-law, became part of a new book that Bethlehem released this year called The Alphabet Takes a Journey…Destination Ethiopia. Earlier this summer Bethlehem’s family traveled to Ethiopia once again and hiked up 13,500 feet above sea level in the Simien mountains. “It was so gorgeous, so fresh, you feel very proud. My husband and my sister-in-law took the majority of the pictures in the book,” Bethlehem says. “Including the one of the Blue Nile Falls.” Some of the remaining images were derived from an eclectic collection retrieved from friends who had visited Ethiopia as well as from Ethiopian Airlines. Bethlehem was born and raised in Addis Ababa and attended Addis Ababa University prior to working at the UN Economic Commission for Africa (ECA) office in the capital. She now resides in Fargo, North Dakota and overseas projects and manages teams working on healthcare related software at Intelligent InSites, a Fargo based software company. 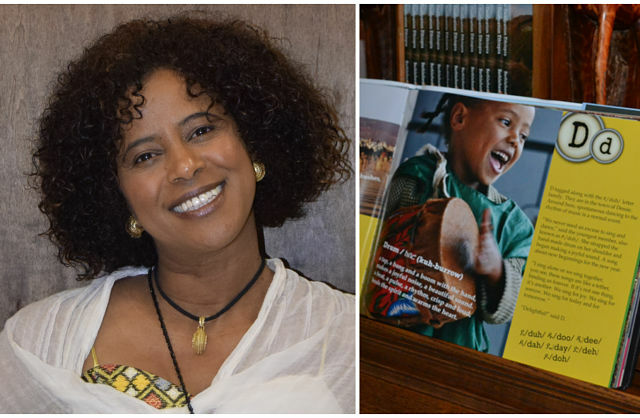 Her children’s book, The Alphabet Takes a Journey…Destination Ethiopia is catalogued at the Library of Congress. You can learn more and purchase the book at www.bethlehemgronneberg.com.